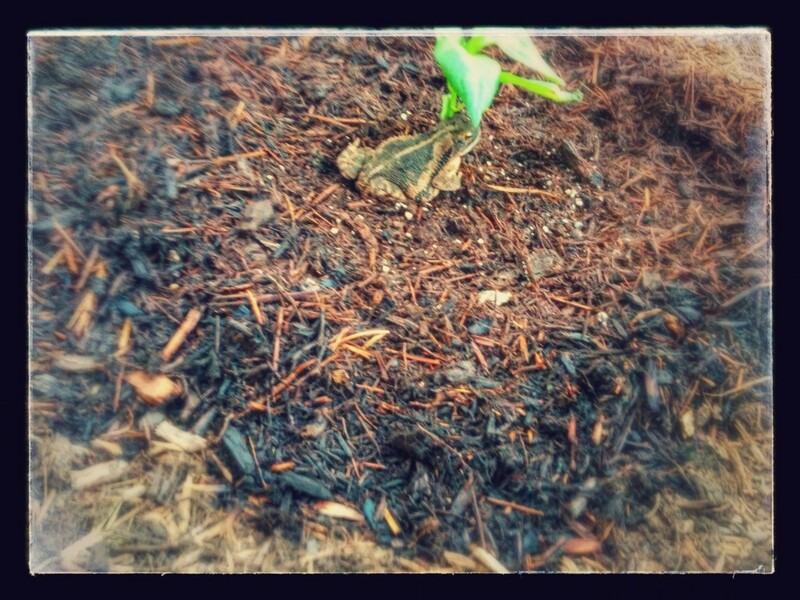 Weekly Happenings: Not much, I’m afraid to say. We mostly stayed inside at home because of the weather (it seems like Joseph gets pretty warm pretty fast), but Paul put in a lot of work yesterday to make the backyard a bit more habitable to play in (more about that later), so I hope to be able to take Joseph out more. Joseph did get one play date this week since I had to go an enter my visiting teaching report at church (the RS president has a boy about his age that he likes to play with). The Weekly Weather: The heat has continued (which is only to be expected…it is August, after all). Not much rain in sight (also another regular for August), and we’re hoping not to fall into Stage 3 water restrictions, because that would mean we could only water our lawn every other week, which would not be good for it or the trees. We’re praying for rain to come! What Sarah’s Been Up To: Not too much out of the ordinary during the week. This weekend (including Friday) was a tax-free one in Texas, meaning that certain items (mostly clothes and school supplies) were tax-free. So, yesterday and the day before, Joseph and I did a lot of clothes shopping in order to get the next size clothes up for him (especially since his current clothes are starting to get snug). 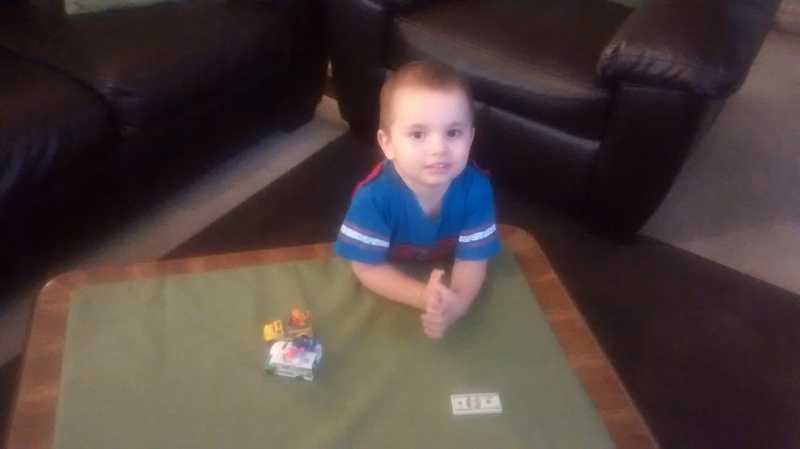 I was able to get almost all of his wardrobe for less than $200. I’m also continuing my efforts in working out and eating less so that I can lose the weight that I need to before I get pregnant with baby #2. Paul had me put an app on my phone that helps a lot. I can enter the food I eat and it will tell me the amount of calories (as well as help me check to see if I want to eat something because I can check ahead of time how many calories are in it, if it’s not prepackaged). I can also log how much I exercise so that it tells me how many calories I’m burning throughout the day. I’ve lost 2 pounds in the past week and a half or so, which (to me, at least) is a big deal! 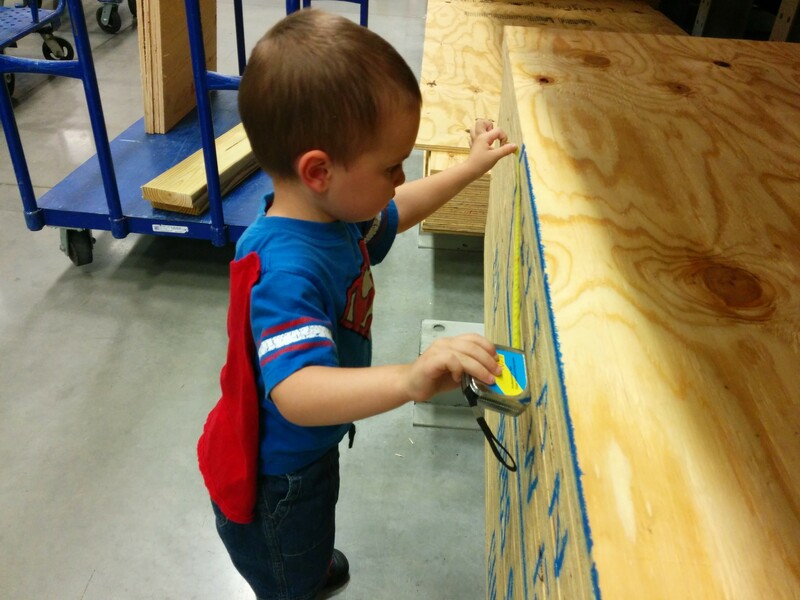 What Joseph’s Been Up To: His imagination (as well as independent play) is getting more and more expansive. He also still says and does things that make me smile and laugh every day. One cute thing that he did (that I remembered to make note of) was the evening after he smacked his ear pretty badly on the back of the couch (luckily it looks like it’s just going to be bruised up for a while…we; and especially Paul, since he’s experienced it before, were worried about fluid retention and it possibly causing cauliflower ear, which would mean surgery…but it doesn’t look like that’s happening). As I was putting him to bed, he grabbed his lovey monkey (his little soft square of fabric that has a monkey head as part of it) and put the monkey up to his ear, making a kissing noise. 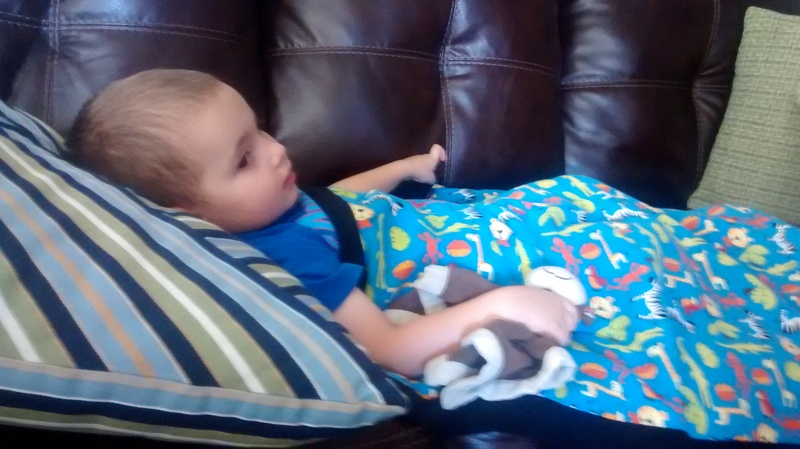 He then said that his lovey monkey had kissed his owie ear. 🙂 Oh, and last night, when I went to put him to bed (a bit early, since we were having friends over), he told me it was too bright and to get the box (a large piece of cardboard) from the closet and put it in the window (we did that on occasion to make it darker when he napped, but haven’t done it for months, since he hasn’t napped for months…I was surprised that he still remembered it). 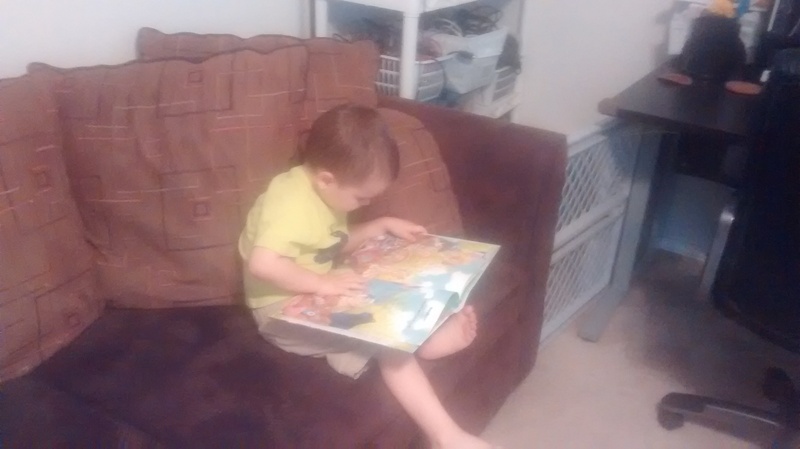 Doing one of the things that he likes to do best: look at books. 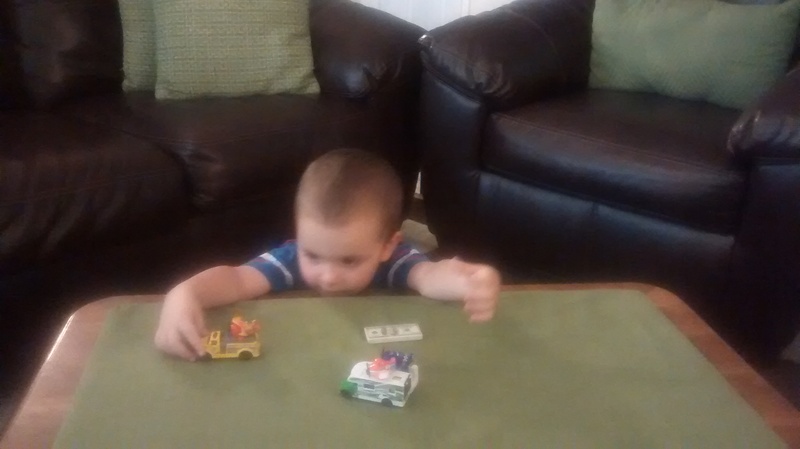 Using his trucks to give his planes a ride. 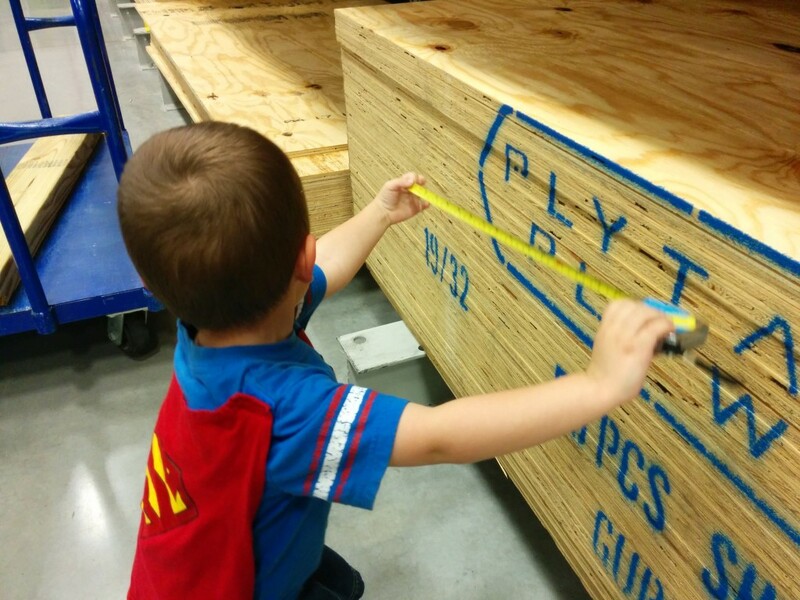 A trip to Lowe’s with Daddy…always the little helper. Wearing his new hat. He was not too happy that his monkey hat got too small. 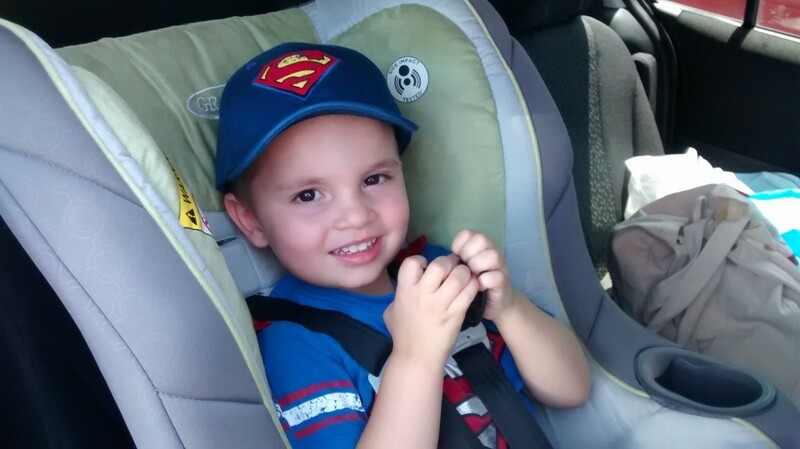 Finding a Superman hat made him feel a lot better, though. 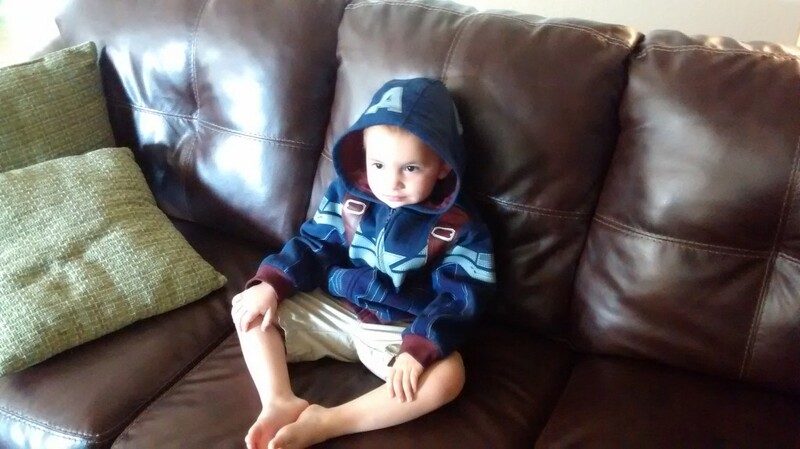 I must admit that I splurged a bit on the jacket (it’s a Captain America one from the Disney store), but it’s better made than the less-expensive ones and should be heavy enough for a Texas winter, even. 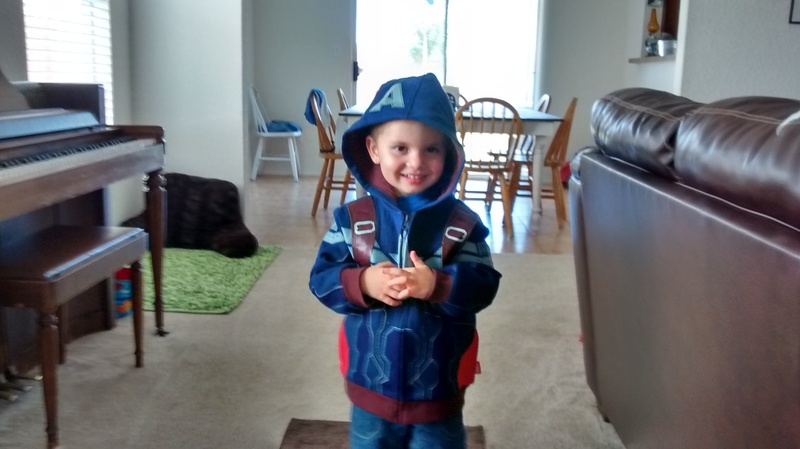 He insisted on wearing it all the time (at home) for the first couple of days. 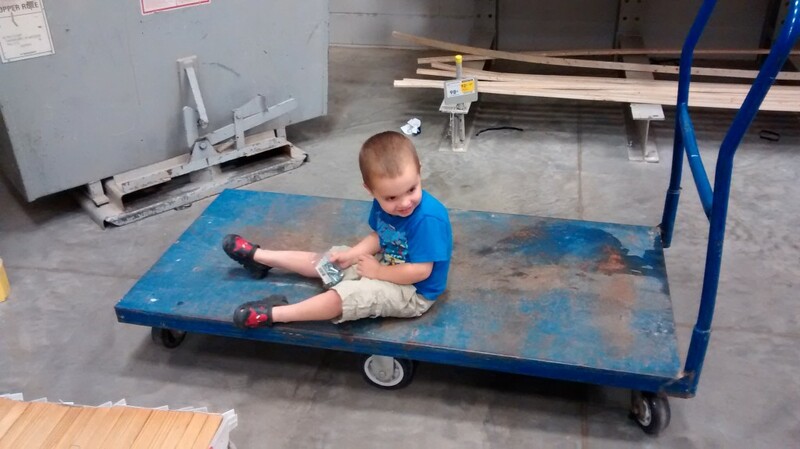 Riding on the lumber cart at Lowe’s.